A former jockey, Kevin Ryan is one of the most respected handlers in The North. Training since 1998, Ryan has seen the number of boxes in his yard grow to well over 100. He can train low grade animals but is equally adept at competing with the elite, as his numerous Group One victories will testify to. In this article we delve into Kevin Ryan’s past runners, trying to identify any trends that can prove useful, looking for when he performs well and when his horses do not run as expected. *A/E denotes actual number of winners divided by expected number of winners. A figure over 1 represents good value, anything under 1 is poor value. Along with a clear trend in the time of year when his debutant 2 year olds are most successful, Ryan also shows a preference to certain courses, doing particularly well at Leicester, Southwell, Catterick and York. He has a particularly poor record at Carlisle, Ripon and Doncaster, and a moderate one at Wolverhampton. Kevin Ryan doesn’t often have 3 year old debutant runners. In fact, in the last 10 years, he has only had 87, with 10 winners. His horses have tended to start their life at 2 and are running handicaps when they turn 3. How do his last time out 3 year old winners racing in handicaps do? Ryan has a fantastic record with his 3 year olds when they won last time and are turned out within 2 weeks (18 winners from 43 runners when his horses were carrying a 6lb penalty for their previous success). He clearly likes to strike while the iron is hot with these horses, and they can often run up a sequence. While many trainers exhibit biases in terms of the performance of their older horses throughout the year, Kevin Ryan is remarkably consistent in each month, never really dipping below his expected number of winners in handicaps. Kevin Ryan 3 year old+ handicappers don’t have a fantastic record when they are returning to the track from an extended absence – he rarely has them tuned up first time back. There are some pertinent trends that can be taken out of the data. 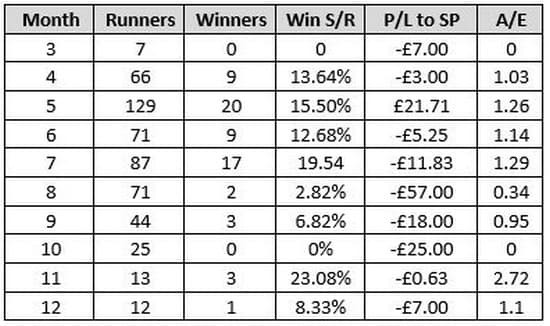 From January to March, the results seem fairly random, with February proving very profitable from a small number of runners, and March proving poor. Ryan’s performance in April and May are just shy of average, which figures, as many other runners competing in handicaps are also making their seasonal reappearance and as such have their own fitness and match sharpness issues to contend with. From June, the winners really dry up. 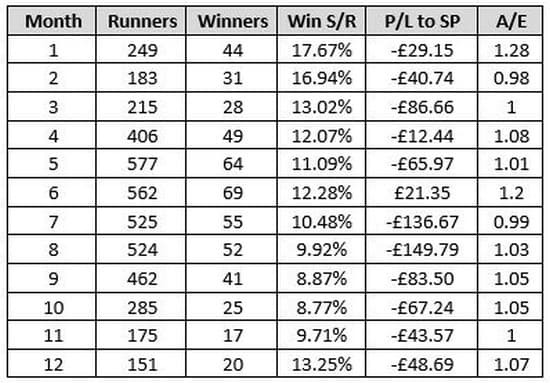 Operating at just a 2.5% strike rate with 18 places in June-December with his handicap returners, Kevin Ryan runners should be avoided for backing purposes at this time of year, and could make solid laying opportunities. 37 of those runners were 10/1 or shorter, and just 1 won. 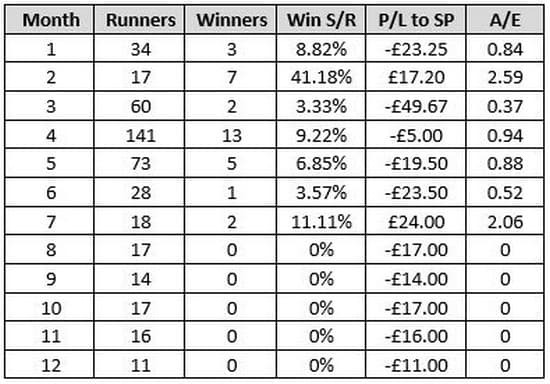 The time to follow Kevin Ryan first time out 2year olds is May-July, they do poorly from August-October. Excels with his 2 year old debutants at Leicester, Southwell, Catterick and York but does poorly at Wolverhampton, Doncaster, Ripon and Chester. Follow his last time out winning 3 year olds in handicaps when they are turned out within 2 weeks of previous victory, they operate at a fantastic strike rate. Ryan’s handicappers who are returning from a 3 month+ absence have a very moderate record on their comeback run from June-December, and could make good lay bets. Although his runners have a higher strike rate in the early months, they generally perform up to market expectations all year round. No real bias towards any distances. Although past results are not indicative of future performance, there are some strong trends in the data, which can be particularly valuable when punters are looking at Kevin Ryan runners.